This is the sixth 2010 FALL COLOR REPORT for New York State. Reports are obtained from field observers and reflect expected color conditions for the coming weekend. FALL COLOR REPORTS are issued every Wednesday afternoon. Albany, N.Y. - Beautiful peak and near peak fall foliage continues its 2010 tour across New York State this weekend, with stops in the Finger Lakes, Capital-Saratoga, Hudson Valley, Thousand Islands-Seaway, Chautauqua-Allegheny, Central New York and southern and eastern Adirondacks regions, according to observers for Empire State Development&apos;s I LOVE NEW YORK program. Peak and near peak colors will be found throughout the Finger Lakes region this weekend. In Ontario County, look for peak leaves and nearly 90 percent color change marked by bright gold, orange and yellow leaves, along with accenting reds. Onondaga County expects to be at peak by the weekend with a brilliant mix of yellow, red and purple leaves. Steuben County foliage spotters are calling for peak foliage this weekend with 80-90 percent color change and shades of orange and red predominating. In Chemung County color transition should be between 80 to 85 percent and you can expect a mix of peak to past peak foliage highlighted by some nice displays of gold, red, purple and burnt orange leaves. Wayne County foliage spotters expect 65-75 percent color change and average-to-bright gold leaves predominating. The near peak foliage also includes some nice accents of red and orange. Yates County projects 75 percent color change and a nice display of near peak foliage marked by very brilliant shades of red, yellow and orange. Also look for 75 percent color change in Livingston County, with average-to-bright gold, orange and red leaves predominating. Cayuga County leaf peepers expect near peak foliage with 70 percent change and bright gold and orange leaves predominating. In Monroe County and the Rochester area, color changes ranging from 45-60 percent are projected for the coming weekend. Most of the colors are muted shades of yellow; in the city, you will also find spikes of red and orange appearing. Schuyler County foliage spotters expect 35-40 percent color change this weekend with bright orange and yellow leaves. Tioga County will be just past peak with orange, yellow and some green leaves of average brilliance. In the Capital-Saratoga region, you&apos;ll find a mix of near peak to past peak conditions. 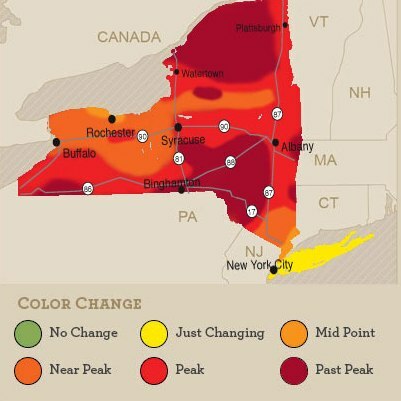 In Saratoga Springs, color change is expected to be around 95-100 percent with a mix of near peak to peak foliage and average-to-bright red, orange and yellow leaves. Foliage spotters based in Voorheesville in Albany County are calling for peak color this weekend at Thatcher Park, and some just past peak colors in the surrounding areas. Foliage in Schenectady County should be about 65-70 percent changed this weekend with brilliant shades of yellow and gold, along with touches of red. Rensselaer County is past peak, although you will find some remaining pockets of color in the hills and valley. In the Hudson Valley, Columbia County expects to be at peak this weekend with 80 percent color change in the southern/valley area and 100 percent change in the northern/mountain portion. Look for yellow and orange leaves predominating. In Dutchess County, peak conditions are expected along the Hudson River as spotters are seeing more bright oranges joining the yellows and golds. The eastern part of county is just past peak but you&apos;ll find some really nice colors including bright yellows, golds and rusts. In Rockland County, near peak to peak leaves are expected in the Bear Mountain area, with 80 percent color change and a mostly bright mix of yellow, red and orange leaves. To the south, spotters in New City expect 50 percent change and bright mix of emerging shades of yellow and red. Orange County has seen some dramatic color change over the past week. By the weekend expect 50 percent transition and brilliant shades of red, orange, russet, yellow and peach. Westchester County should be approximately 30 percent changed by the weekend, as more and more shades of dark red and orange start to appear. In the Thousand Islands-Seaway region, peak color has arrived in Oswego County. Brilliant shades of red, maroon, orange, amber, gold and yellow dominate the northern section of the county, while you will find about 40 percent color change and midpoint to near peak conditions in county&apos;s southern areas. You&apos;ll also find some peak colors in the southern portion of Jefferson County, where nearly 100 percent color change is expected by the weekend, along with brilliant yellow, orange and red leaves. Chautauqua-Allegheny foliage spotters are calling for peak conditions this weekend in Cattaraugus County with 85 percent color change and dull shades of yellow, along with touches of red and green. Peak color is also expected in Allegany County, where spotters in Belmont expect 95 percent color transition and bright red, orange and yellow leaves. In Central New York, leaf peepers in Oneida County expect peak foliage with nearly 100 percent color change and muted shades of orange, yellow, amber and gold. Also look for peak condition in Madison County, where the fall colors have really emerged over the past week. You&apos;ll find the best and brightest color in areas north of US Route 20, including a lot of orange along with some scarlet from the soft maples accenting the hillsides. Peak colors are also expected this weekend in southern Herkimer County. The best colors are up in the hillsides that flank the valley and include many shades of gold and orange, with accents of red. Schoharie County spotters expect just past peak leaves for the weekend, as many leaves have fallen while those remaining include some nice shades of orange, along with a few reds and harvest yellows. With the higher elevations of the Adirondacks now past peak, the region&apos;s fall color show has moved to its southern and eastern portions. In the southern part of Warren County, expect nearly 100 percent color change by the weekend, with brilliant yellow, red and orange leaves. Foliage spotters in Essex County along Lake Champlain expect 80 to nearly 100 percent color change, with average shades of yellow, orange and red predominating. Peak foliage has also, for the most part, exited the Catskills region; however foliage spotters in Delaware, Ulster, Greene and Sullivan counties expect bright fall colors just past peak to remain over the coming weekend. It should be a near peak weekend in the Greater Niagara region. Foliage spotters in Orleans County are calling for 90 percent color change and muted shades of yellow along with some orange. In Niagara County, expect 75-80 percent color change, with brilliant gold-orange leaves accented by bursts of yellow and red. In Wyoming County, the past week&apos;s cool evening temperatures have brought 60 percent color change, along with bursts of burnt orange, yellow and burgundy leaves. Midpoint to near peak conditions will prevail this weekend in most of Erie and Genesee counties. In Genesee County, expect around 40 percent color change and an even mix of green and fall-colored leaves, and minimal droppage. In the Buffalo area of Erie County, shades of dark orange and bright yellow remain dominant along with scattered swaths of deep burgundy. Look for 25 percent transition across Long Island this weekend. Out on the Hamptons, the predominately green backdrop is giving way to dull gold leaves. In Nassau and western Suffolk counties, orange, yellow, red and purple leaves of average brilliance are expected by the weekend. In New York City, color change will be just around 10 percent by the weekend. Get Up-to-Date Fall Foliage Color Reports Online New York&apos;s weekly I LOVE NEW YORK fall foliage color reports continue until the end of the foliage season, around the first week in November. Each Wednesday afternoon throughout the season, reports are updated online to provide the latest information on foliage color conditions in each region of the state. The weekly foliage report, a detailed map charting fall color progress, vantage points for viewing spectacular foliage, suggested autumn getaways and weekly event listings are available by visiting the I LOVE NEW YORK web site at http://www.iloveny.com/. Reports are also available by dialing, toll-free, 800/CALL-NYS (800/225-5697) from anywhere in the U.S., its territories and Canada. From all other areas, the number is 518/474-4116. For information on becoming a volunteer Leaf Peeper, e-mail your name, address and phone number to foliage@empire.state.ny.us. Look for Foliage Updates on Twitter and Facebook You can also get early foliage updates, plus access to each Wednesday&apos;s full foliage report, via I LOVE NEW YORK&apos;s Twitter (twitter.com/I_LOVE_NY) and Facebook (www.facebook.com/iloveny) pages. Also, check the I LOVE NEW YORK Flickr page (www.flickr.com/photos/officialiloveny) for photographs of this season&apos;s gorgeous fall foliage. I LOVE NEW YORK recently became the first state tourist organization to break the 30,000 followers mark on Twitter. About New York State New York State features 11 beautiful vacation regions. New York&apos;s attractions span from landmarks such as Niagara Falls, to the wine trails of Hudson Valley and treasures like the Baseball Hall of Fame in Cooperstown. Whether it&apos;s wide-ranging outdoor activities for the whole family like fishing, hiking and boating, culinary wonders and farm-to-table fresh foods, or the rich history and culture of one of the 13 original colonies, New York State offers diverse activities for all travelers. For more information visit http://www.iloveny.com/. Media can find press releases and more at thebeat.iloveny.com.